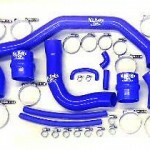 Mr. Bob’s Distributing is now offering high quality silicone hoses for the 94-2002 Dodge Cummins pickups. Turbo hoses are 4 ply and very flexible for easy installation. More importantly they come with eight new spring loaded stainless steel clamps. 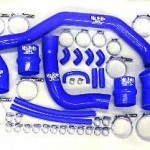 Kits include upper and lower radiator hoses, as well as all the 5/8″ heater and trans cooler hoses for the automatics. The 1/4 inch bypass hose for the 12 valve engines is also provided. Turbo hoses are 4 ply and very flexible for easy installation. These are the heavy duty versions with channel at the bridge to prevent blowing a hose. 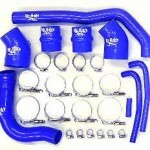 (A common problem when running higher boost) Cooling system hoses are of a quality consistent with big rig trucks. The cooling system should be serviced with new coolant and distilled water every 45,000 miles or 3 years and is the perfect time to upgrade hoses. Merchandise is warranted to be free from defect in material or workmanship. Liability under any express or implied warranty is limited to the purchase price of any merchandise proved to be defective, or at manufacturer’s option, to replacement of such merchandise. and numerous ( varies between kits) radiator & heater hose liner clamps. 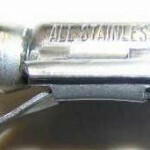 The spring loaded clamps are stainless with a plated T-bolt.